Vienna, the capital of Austria, is the cultural capital of Europe and fondly referred to as the 'city of music'. Vienna boasts of an exceptionally high standard of living and is fast becoming a major player in the economic and financial circle of the world. Vienna continues to attract a number of professionals from all over the world to be a part of the dynamic work environment that the city promotes. Vienna is home to a number of head offices of a number of prominent corporate organizations leading to a burgeoning employment market. A number of IT start-ups have mushroomed in the city and have consequently created a demand for certified IT professionals. Companies are in constant search for skilled professionals to fill the vacancies in start-ups that have emerged all over the city. To help meet this demand, KnowledgeHut offers various online learning opportunities including CSD certification in Vienna for those professionals seeking to remain indispensable to their companies. There are a plenty of e-learning options available today for professionals seeking to upgrade their skill-set to stay updated with the latest developments in their field. The course in CSD certification in Vienna is tailor-made for professionals looking to make a career in software development in the scrum framework. 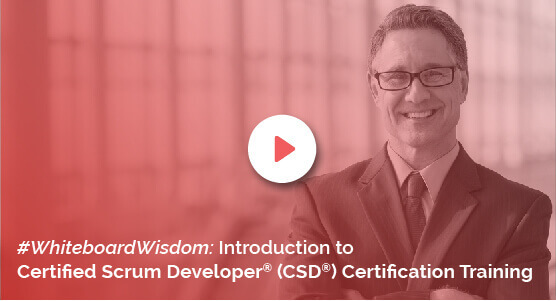 The online modules of the CSD training in Vienna are comprehensive and cover all the latest developments in the field of a certified scrum developer. Online training provided by KnowledgeHut is designed to expose students to the fundamentals of software development in the scrum environment. KnowledgeHut provides superior quality training in Certified Scrum Developer certification. This scrum development certification will definitely be a valuable skill-building addition to ones repertoire and will go a long way in furthering ones career in software development in the scrum framework. The price of the course offered by KnowledgeHut is extremely reasonable and is a safe and wise investment for professionals looking to certify themselves as software developers. KnowledgeHut's online classes on Certified Scrum Developer training in Vienna will definitely help you stay employable and keep you one step ahead of your peers in the field.